YRF’s Tiger Zinda Hai is unstoppable at the box office currently. And the film’s anthem, Swag Se Swagat, has set its own massive records online. The song has become the fastest Bollywood number to clock 200 million plus views on YouTube. This makes it the only Bollywood song to be one of the top 50 in YouTube’s coveted ‘Fastest 200 Million’ list worldwide. A mindboggling 200 million plus views in just 50 days sets Swag Se Swagat apart by creating a new benchmark for Hindi film music. It also reflects just how popular the song has become with listeners across the world. Since it’s release, the song has set trends and broken multiple records. It became the fastest Bollywood song to cross 1 million likes on YouTube on 11th December and on 15th December, the song clocked 100 million plus views, becoming the fastest Bollywood number to cross that milestone on the video streaming platform. Swag Se Swagat touched the big Million number in just 26 days of it’s release, having become an anthem across India. Written by Irshad Kamil, composed by Vishal and Shekhar, sung by Vishal Dadlani and Neha Bhasin, Swag Se Swagat speaks up for universal brotherhood, peace and love. The song is choreographed by Vaibhavi Merchant. 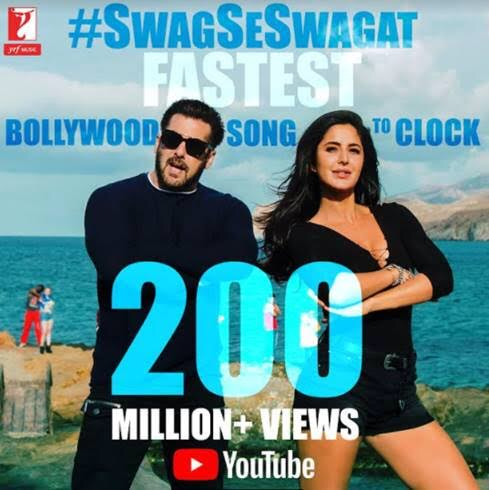 With Salman Khan, Katrina Kaif and a bevy of dancers from all over the globe swaying to Swag on the picturesque locales of Greece, Swag Se Swagat is a treat for all music lovers. And as it’s mind boggling popularity online shows, this song has transcended cultures and borders and has been viewed worldwide.